In 1947 Rev. and Mrs. Robb French, Wesleyan Methodist evangelists, and Rev. and Mrs. James Zuch purchased a twenty-eight-acre plot of ground in Hobe Sound, Florida, for less than $200 an acre. Their intent was to carve out of the thick palmetto bushes a place for a campground where church services would be held. Primary access to this rescued sanctuary passed two white pillars and proceeded down “Bethel Way.” The first buildings were army squad cabins moved from Jacksonville. Later buildings were purchased from Camp Murphy (near present day Jonathan Dickinson State Park) and moved to the new campus. The first camp was held February 5-15, 1948. The year 1960 saw a dramatic change in the level of activity. Dr. Stephen Douglas Herron, a pastor in Knoxville, Tennessee, keenly felt that public and theological education had failed to meet its moral responsibility. He desired to begin a Bible college and approached his long-time friend, Rev. H. Robb French, about the possibilities of establishing a college on the camp grounds. In 1960, Dr. and Mrs. Herron and their young daughter Jane arrived to make Hobe Sound their home. The beginning faculty was Rev. Herron, Mrs. Amy Zike—a retired teacher who lived on the grounds, and Rev. and Mrs. C. J. Goodspeed. The early instructors served without pay, though some exceptions afforded a $50.00 per month stipend with housing, meals and utilities provided. In November 1960, the Elementary Christian School was established at the request of camp residents. 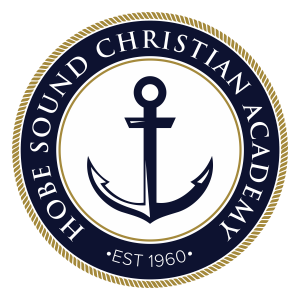 Miss Melva McNees and Mrs. Amy Zike served as instructors and later were joined by Miss Virginia Fink who would spend her lifetime serving the interests of Hobe Sound Bible College and Academy. The high school department was added to the Academy in 1962. The Academy continues to graduate quality students who fill their roles in society. May 11, 1964, was a red-letter day in the history of this emerging education institution. It was the first commencement day. Two would graduate from the college—Raymond Shreve and Robert Whitaker, while six would receive diplomas from the academy. In the succeeding years, many graduates would follow them across the platform, turning the tassels and taking their place in the Christian work force.